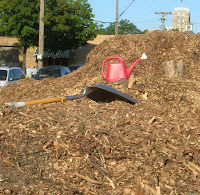 The city crews leave their tree-maintenance wood chips at four sites I know of. We use a lot of this stuff for paths and mulch. We lay cardboard or newsprint first and layer wood chips over that. It’s great weed control. Underneath, the soil is softer and moister. A couple years ago, I went around trying to push a sharpened rod into the ground. Usually it went in a foot or eighteen inches. It went in as far as I wanted to push it in the mulched areas. Minneapolis has a lot of elms, but I don’t think that the wood chips are from them, because spreading elm chips would spread Dutch Elm Disease. We did harvest a single morel mushroom once, though. Morels are symbiotic with elms, and sometimes appear when the trees are removed, but they are also symbiotic with ash, apples, and cottonwoods, all part of the urban forest. There were three peaks and I’m still learning to take photographs. It seems like the camera is good at getting a likeness, but doesn’t show space very well. I tried to show scale and depth with the shovel and watering can in the picture. The people in the background help, too, but the picture still seems flat.